The H&H Catfish Skinning Pliers are the ideal skinning pliers for cleaning catfish easier, quicker and neater! 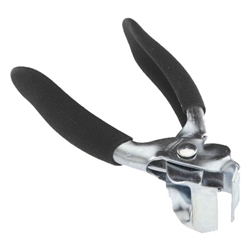 These Pliers are made of a Carbon Steel Construction for durability and have a Soft Grip Handle for comfort. The H&H Skinning Pliers feature precision jaws that grasp skin securely and have a built-in side blade cutter for easy slicing to begin skinning fish. For Left or Right Handed Use.